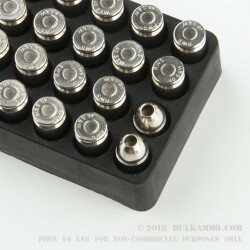 A radical concept come to life in this new self-defense 40 SW ammunition. 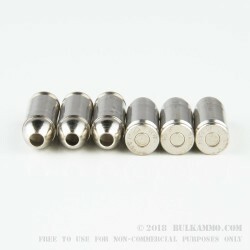 Where lightweight projectiles and hyper-velocity combine to make an effective threat stopper instead of relying on the traditional heavier weight bullets and standard velocities. Liberty ammunition makes a compelling case for those who want to try new theory and technologies to help determine what’s best for their needs. 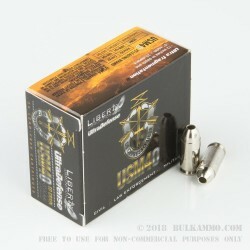 This ammunition features a .40 S&W projectile of 60 grains with a large cavity and an all copper projectile. In practice what happens is that when a bullet of this weight (60 grains) and with this velocity (2000 feet per second) hits ballistic gelatin, it immediately separates as the large cavity fills up with material and deflects outwardly from inside the cavity it separates the inside of the conical bullet hollow, releasing fragments of the bullet nose shape and the base separates and continues to penetrate. The lack of mass on the separated “petals” or fragments causes it to create a large wound channel but stop penetrating much further. The remaining base of the bullet continues to penetrate, but not to depths that are close to the original/traditional projectiles. The base retains about two thirds of total original projectile weight. In theory the hyper-velocity projectile, when impacting flesh and bone structures, eliminates the common elasticity that occurs with normal velocities – creating more extensive wound channels diameter wise and creating unrepairable tissue. While this concept hasn’t been tested in enough real life situations to get a base marker to measure effectiveness, it does represent a new and interesting way to look at effective threat stopping through ballistics. Q: What is the advertised muzzle velocity? A: Hello! 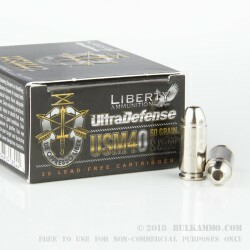 Liberty Ammunition lists the muzzle velocity of this specific round at 2000 fps.